Note: This method is suitable for immunofluorescence on tissue sample. PBS: To prepare 1 L 1X PBS: dissolve 8g of NaCl, 0.2g of KCl, 1.44g of Na2HPO4, 0.24g of KH2PO4 in 800ml distilled H2O, then adjust pH to 7.4 with HCl and adjust volume to 1L with additional distilled H2O. Blocking buffer: To prepare 10 ml, add 0.5 ml normal serum in PBS and mix well. While stirring, add 30 µl Triton™ X-100. NOTE: Select serum that are from the same species as the secondary antibody. 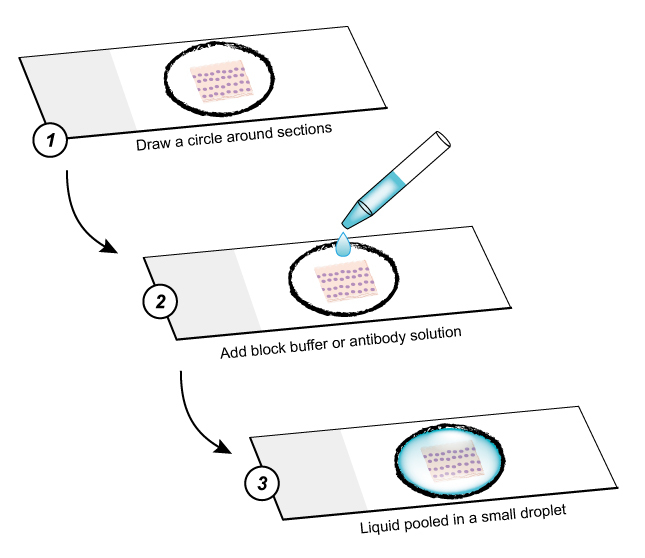 Antibody dilution buffer: To prepare 10 ml, add 30 µl Triton X-100 to 10 ml 1X PBS. Mix well then add 0.1g BSA. 1 The tissue is sliced to ≤10 µm sections and directly mount to adhesive slides. 2 Air dry for 1 hour. 3 Rinse three times in 1X PBS for 5 min each. 4 Drawing a water repellent circle around sections. 5 Sections are incubated in permeablization solution for 3~5 min at room temperature. NOTE: This step is optimized for intracellular staining. 6 Shake off the permeablization solution and draw a cycle around sections with PAP pan to keep a liquid pooled in a single droplet. 7 Drop blocking buffer in the cycle and incubate 1 hour at room temperature. 8 Dilute the primary antibody to the recommended concentration on the datasheet in antibody dilution buffer. 9 Shake off the blocking buffer and drop into the cycle with primary antibody solution and incubate overnight at 4°C. NOTE: If using primary antibodies directly conjugated with fluorochrome, the incubation should be performed in the dark, and then skip to step 12. 10 Rinse three times in 1X PBS for 5 min each. 11 Prepare fluorochrome-conjugated secondary antibody diluted in antibody dilution buffer and incubate for 2~3 hours at room temperature in the dark. 12 Rinse three times in 1X PBS for 5 min each. 13 Coverslip with anti-fade mounting medium. 14 Store at 4°C protecting from light. Learn the principle of immunofluorescence. Learn immunofluorescence staining on free floating sections and cultured cells. If you have any question, please contact us at: info@creative-diagnostics.com.